Never content to rest on his laurels, Carlos Santana is always looking for a way to broaden his horizons. Thus, after the commercial (and artistic) successes of Santana by Santana (the debut album), and Abraxas, he began to shift direction, initially with Santana III. That change took a drastic turn with the release of 1972's Caravanserai, a foray into the burgeoning world of improvisational jazz-rock. 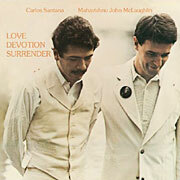 It continued when Santana teamed up with world-class fusion guitarist John McLaughlin, for the album Love Devotion Surrender. Probably influenced by "Mahavishnu" John McLaughlin's long devotion to guru Sri Chimnoy, Carlos made some changes in his life. He cut his hair, started wearing all white, and sported his own spiritual name: "Devadip" Carlos Santana. Unlike McLaughlin's, however, Santana's relationship with Chimnoy was short-lived. Ostensibly a tribute to legendary saxophonist/composer John Coltrane, Love Devotion Surrender actually contained only two of Coltrane's compositions. One is "Naima," a piece Coltrane wrote for his then wife, Juanita Naima Grubb. The other is "A Love Supreme," a song that also uses a pedal tone to underscore chord changes. Of the other songs on the Santana/McLaughlin collaboration, two were written by McLaughlin: "Meditation," and "The Life Divine." The last was a version of a traditional song called "Let Us Go Into the House of the Lord." John McLaughlin and Carlos Santana are undeniably superb guitarists in their own right. The former's Mahavishnu Orchestra albums, especially, were revered by musicians as some ofthe most groundbreaking music of the period. But together, perhaps due to the attempt to seek a common ground, they each seem to play below their potential. Ever the masterful integrator, Santana obviously absorbs some of McLaughlin's avante garde jazz style. However, Carlos doesn't quite have the chops to achieve with it what McLaughlin did: an exciting blend of rock power, jazz phrasing, and incredible speed. On the other hand, John McLaughlin, apparently impressed by Santana's melodic sense, tries to turn his playing in that direction -- but it doesn't meld well with his own style. What's more, both guitarists are at their best when improvising within a structured framework, however, that structure is largely missing from this album, and it renders their minutes-long solos formless and uneventful. When Santana solos within a song format, such as "Soul Sacrifice," "Samba Pa Ti," or "Europa," he creates magic. But without that format, he tends to wander without apparent direction. "Naima" and "Meditation" are arguably the two best tracks on the album, probably due to the fact that they are both acoustic, clock in at around three minutes, and include some melodic structure. The other songs, from the 8-minute "A Love Supreme" to the more than 15-minute "Let Us Go Into the House of the Lord," are largely forgettable. On its own, Love Devotion Surrender is a flawed album. But viewed as a step on the musical excursion that resulted in the powerful Santana guitar sound and playing style that is known and loved worldwide, it is an interesting piece of history.